6-year-old Veronica Moser-Sullivan was a "vibrant little girl"
Rebecca Wingo's father writes he is "inconsolable"
Aurora, Colorado (CNN) -- Stories of heroism, zest for life, a birthday celebration that turned tragic have unfolded as family and friends recall loved ones killed in Friday's mass shooting at a Colorado movie theater. Also emerging was the story of Hugo, who was born Tuesday. Almost all of the 12 victims were young -- including a 6-year-old girl who had just learned to swim. The cause of death in all cases is related to gunshot wounds, according to the Arapahoe County Coroner's Office. Blunk served for five years in the U.S. Navy. He had been planning to fly Saturday to Reno, Nevada, to see his wife, Chantel, his 4-year-old daughter and his 2-year-old son. "We were going to have a family day," Chantel Blunk said. Instead, she put away the dress her daughter had picked out to wear to the airport. "I tried to tell her we wouldn't see Daddy anymore, but that he would still love us and look over us." The couple married in 2007 and separated in 2010, she said. They remained on good terms after Jonathan moved to Colorado. 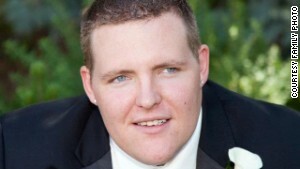 Blunk died shielding his girlfriend from the gunfire inside the theater. Chantel Blunk said she wants her husband to have a military funeral. She said she will remember Jonathan's humor, spontaneity and attention to family. "We love him and he is going to be remembered as a hero," she said. A Facebook page was created in memory of Boik, a Gateway High School student who was at the theater with his girlfriend and a friend. 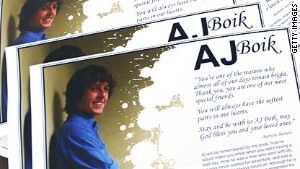 "AJ was an awesome kid and a truly Inspirational teammate," one Facebook entry said. "You cant find someone with a brighter smile and more positive outlook on life. There to help you up when your down and One to carry on life with such an intelligence." Boik was an independent distributor for Organo Gold, a coffee company, and lived in Aurora, according to what appears to be his personal Facebook page. James Crofter, father of Jordan Crofter, Boik's friend who survived the shooting, said Jordan and Boik played lacrosse together. Boik's girlfriend also was in the theater. She and Jordan found each other outside the theater, but Boik did not make it out. Childress, an Air Force reservist, was a cybersystems operator on active duty with the 310th Force Support Squadron at Buckley Air Force Base in Colorado. He was from Thornton, Colorado. 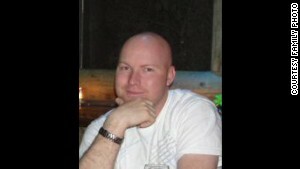 Jesse Childress, 29, an Air Force reservist, was a cybersystems operator on active duty. "Jesse was an invaluable part of the 310th family," said Lt. Col. Pat Walsh, who was Childress' supervisor, according to The Washington Post. "He literally touched everyone in the wing -- over 1,000 people." Three of Childress' Air Force colleagues traveled from Buckley to honor him at a memorial near the theater, The Denver Post reported. "He was a huge part of our unit, and this is a terrible loss. The person that did this was an incredible coward," said Air Force Chief Master Sergeant Schwald, according to the Denver newspaper. She declined to give her first name. Cowden took his two teenage children to the theater. His children escaped unharmed, according to California's Ventura County Star. A family spokesman described Cowden as a "loving father, outdoorsman and small-business owner," according to the Star. "Cowden was a true Texas gentleman that loved life and his family. A quick-witted world traveler with a keen sense of humor, he will be remembered for his devotion to his children and for always trying his best to do the right thing, no matter the obstacle." Jessica Ghawi moved to Denver to try to break into the television market there. Aspiring sports reporter Ghawi narrowly avoided a shooting in Toronto just last month -- an incident that prompted her to reflect on life on her blog. The Toronto shooting at the Eaton Centre left one person dead and seven wounded. Ghawi, who also went by the name Jessica Redfield, grew up in Texas and interned at Ticket 760, a sports radio station in San Antonio, before moving to Denver to try to break into the television market there. A memorial service is scheduled for July 28 in San Antonio. "Sailors were really drawn to his calming demeanor," Cmdr. Jeffrey Jakuboski said of Larimer. Like his father and grandfather, Larimer chose to join the U.S. Navy. He was serving at his first post, said his father, Scott Larimer. A Navy notification team officially informed the family in Crystal Lake, Illinois, around midnight Saturday, a statement from the family said. "He was an outstanding shipmate, a valued member of our Navy team and an extremely dedicated sailor," said Cmdr. Jeffrey Jakuboski. "Sailors were really drawn to his calming demeanor and exceptional work ethic. He was also known as that quiet, extremely competent professional." "He was doing extraordinarily well" and had a bright future ahead of him, Jakuboski said. His unit, part of U.S. Fleet Cyber Command/U.S. 10th Fleet, was stationed at Buckley AFB. Larimer had been in the service for about one year. He had not seen combat. "We send our thoughts and prayers out to the families of the other victims and those still recovering in the hospital," his family said. "We love you, John, and we will miss you always." "I know he's a hero," said Matthew McQuinn's stepfather. "He and Sam (his girlfriend) were very much in love." McQuinn died trying to provide cover for his girlfriend, Samantha Yowler, during the shooting, according to family attorney Rob Scott. Yowler and her brother Nick, who also was trying to protect her from the bullets, both survived. Samantha Yowler, wounded in the knee, is expected to make a full recovery, Scott said. Nick was unharmed. McQuinn and Samantha Yowler grew up in the Miami Valley region of Ohio, according to CNN affiliate WKEF. The two had been dating for a couple of years. McQuinn graduated from Vandalia-Butler High School in 2004. 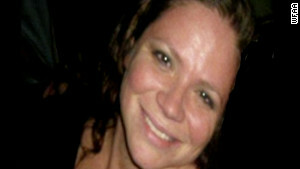 The couple met at a Springfield, Ohio, Target store and moved last November to Denver, the Dayton Daily News reported. The victim's stepfather, David Jackson, told CNN Dayton affiliate WHIO that the couple was planning to move back to Springfield soon. "I know he's a hero," said Jackson. "He and Sam were very much in love and planning their life together. I am sure they were thinking very seriously of getting married soon." Medek wrote: "I'm a simple independent girl who's just trying to get her life together while still having fun." 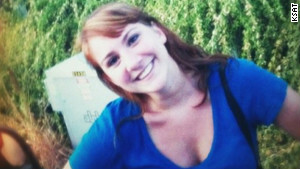 Medek, known to her friends as Cayla, was "very spiritual and close to God," cousin Anita Busch told CNN. Her family is tightly knit, Busch said. Medek's Facebook page describes her as a "sandwich artist/closer" at Subway in Aurora, and a student of general studies at the Community College of Aurora with plans to graduate in 2015. She lived in Westminster, Colorado, but was from Aurora, Busch said. "I'm a simple independent girl who's just trying to get her life together while still having fun," Medek wrote on her Facebook page. Busch said the family did not learn of Medek's death for 19 hours. "We had been desperately trying to find her," she said. Thirteen-year-old Kaylan was Veronica's babysitter, and she was seated with the girl and Veronica's mother when the shooting began. "He just kept firing and then he would stop like he was reloading and he kept firing at anyone he saw," Kaylan told CNN's Poppy Harlow. Kaylan watched as three people with her were shot -- Veronica, the girl's mother, Ashley Moser, and their pastor, Michael Walker. "I felt like it was partly my job to protect her and even if I wasn't her babysitter I would still feel that same because she was just a child," she said. Lying on the theater floor, she called 911, then put her hand on Veronica's ribcage to see if she was breathing. "But she wasn't breathing so I started freaking out and then they told me to do CPR and I told them I couldn't because her mother was on top of her and couldn't move." Described as a "vibrant little girl," Veronica -- an only child -- had just learned to swim and was "excited about life," her great-aunt said. The girl's 25-year-old mother was critically injured, with wounds to the neck and abdomen, said Moser's niece, Annie Dalton. "Her whole life has changed in a flash, for what?" Moser had just been accepted into a licensed practical nurse program, Dalton told reporters. "Obviously, with this injury she is not going to be able to start school like she planned." Alex Sullivan's uncle said the young man "never had a bad chip on his shoulder." He died on his 27th birthday. Alex "Sully" Sullivan went to the movie to celebrate his birthday, two days before the first anniversary of his marriage to Cassie. "Oh man one hour till the movie and its going to be the best BIRTHDAY ever," he tweeted. "The Sullivan family lost a cherished member of their family," a representative said in a statement. "Alex was smart, funny, and above all loved dearly by his friends and family." His uncle, Jim Loewenguth, said Sullivan was "full of joy" and "never had a bad chip on his shoulder." Teves died protecting his girlfriend. 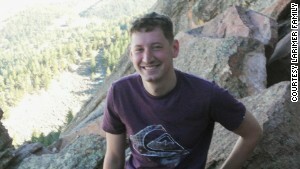 Alexander Teves recently graduated from the University of Denver with a master's degree in counseling psychology. "The university extends its deepest condolences to his family and friends, including the many current students and faculty who knew and worked with Alex," the school said in a statement. 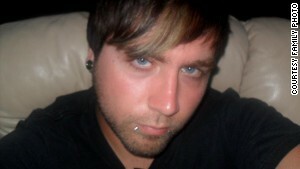 Teves died protecting his girlfriend, Amanda Lindgren. "I wouldn't be here without him," Lindgren told CNN Monday. 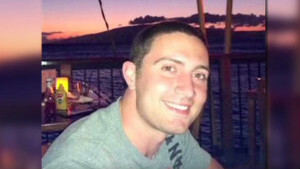 His aunt, Barbara Slivinske, said Alex was living in Colorado and had just completed graduate school there in June. 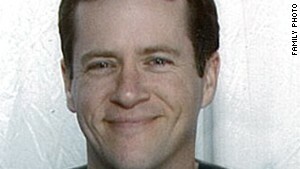 His parents were in Colorado, retrieving his body, according to Slivinske, who added, "He was a wonderful nephew." Rebecca Wingo was originally from Quinlan, Texas, and lived in Aurora, Colorado. Her father, Steve Hernandez, announced his daughter's death on Facebook, saying, "I lost my daughter yesterday to a mad man, my grief right now is inconsolable." 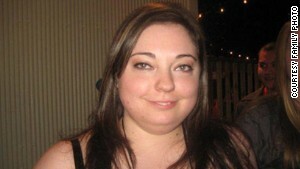 Rebecca Wingo's father says he is "inconsolable." "I hear she died instantly, without pain, however the pain is unbearable. Lord why, why, why????" Hernandez wrote. "I sit here and resist this entry however I feel I must, in disgust, in dismay, in prayer, I love you my daughter Rebecca, we all will miss you." Wingo joined the Air Force after high school, became fluent in Mandarin and served as a translator, according to CNN Dallas-Fort Worth affiliate WFAA. She had "the sweetest smile you've ever seen," said friend Hal Wallace. "She got prettier as she grew older." Wingo moved to Colorado with her two young girls, and wrote about how the younger one was excited about starting kindergarten. Said Wallace: "In the blink of an eye something happens and completely changes everyone's life -- forever." Amid the tales of strength in the face of death, a tale of survival has emerged. Baby Hugo was born Tuesday morning to Katie and Caleb Medley. They had gone to the movie as a treat before the expected delivery this week of their child. The gunfire did not strike Katie, but Caleb was shot in the face, lost his right eye, suffered brain damage and is in critical condition. His brother said Caleb seems to understand what happened, but it was unclear whether he knew he has a baby boy. "He's making small improvements, baby steps every day," said Seth Medley about his eldest brother. When the baby was taken into Caleb's hospital room, "he moved his hand towards the baby, trying to feel his son, trying to touch him." Caleb's heart rate and blood pressure rose, Seth said. Caleb had been doing standup comedy routines in Denver and was working full time at Target, but he had no health insurance, his brother said. Seth Medley said becoming an uncle was bittersweet for him. "We were all looking forward to this," he said. "It's a silver lining to a very dark cloud, but we all know Caleb, we know he's a fighter, we know he's not going to stay out of that child's life for any length of time if he can avoid it." CNN's Nick Valencia, Barbara Starr, Holly Yan, Carma Hassan, David Ariosto, Phil Gast, Greg Morrison and Allison Rampley contributed to this report. Meet the victims involved in the Colorado theater massacre through shared photos and read the memories kept alive by their loved ones. Colorado shooting suspect has offered to plead guilty and spend the rest of his life behind bars in exchange for avoiding the death penalty. Back in the 1950s, Hollywood fell in love with the idea of truth serum. But it doesn't work the way the movies have made it seem. Lawyers for James Holmes, the Aurora, Colorado, mass shooting suspect, took aim against the state's insanity defense laws in court documents made public Friday. So much blood the theater floor had become slippery. Bodies with horrific injuries. The eerie sound of cell phones ringing, over and over again. Relatives of nine people killed said an invitation to attend an event on the eve of the remodeled complex's reopening is "disgusting." Colorado movie shooting suspect James Holmes was charged Monday with 24 counts of first-degree murder -- two counts for each of the 12 people killed in the shooting. From the silver lining of welcoming a newborn into the world on Tuesday to promising to live life to the fullest, survivors are looking forward. James E. Holmes is described by those who know him as a quiet, clean-cut doctoral student. Timeline: Worst mass shootings in U.S.
A heavily armed gunman opened fire at a movie theater on July 20, killing at least 12 and wounding 38. Here are some of the worst U.S. mass shootings since World War II. Photos of the scene in Aurora after the shooting took place. A heavily armed gunman sprayed the audience with gunfire during an early morning screening of the new Batman movie, killing 12 and wounding 38 others, authorities said. Are you a friend or family member of one of the victims? Share your tributes here.